It’s a common refrain that success comes not from never falling, but from getting up every time we do. That may be great for motivation’s sake, but the people at Shoes for Crews find that when it comes to business, it’s better to help customers stay on their feet in the first place. Stan and Arna Smith founded Shoes for Crews as Trends-Mates out of their New York City apartment with the goal of selling comfortable shoes to nurses and other people who worked on their feet all day. In 1984 they decided to target the booming fast-food industry. This didn’t work; none of the major national chains were interested in bulk purchases of purely comfortable shoes for employees. What the Smiths did learn from a risk manager at Burger King, though, was that if they could “create a shoe that was ‘slip-resistant,’ Burger King would be interested.” After a few years, several product iterations, and the addition of a chemist and expert in the fields of tribology and slip and fall accident–prevention, Dr. John Cockrell, as Director of Research & Development, the industry’s top slip-resistant shoe sole was born. “A friend recommendation goes so much farther than any message we can put out there." From those humble beginnings in a Flatiron District apartment rose the (since renamed) Shoes for Crews of today. With headquarters in West Palm Beach, Florida, and additional regional operations in Europe and Asia, the company provides slip-resistant footwear to over 100,000 workplaces. 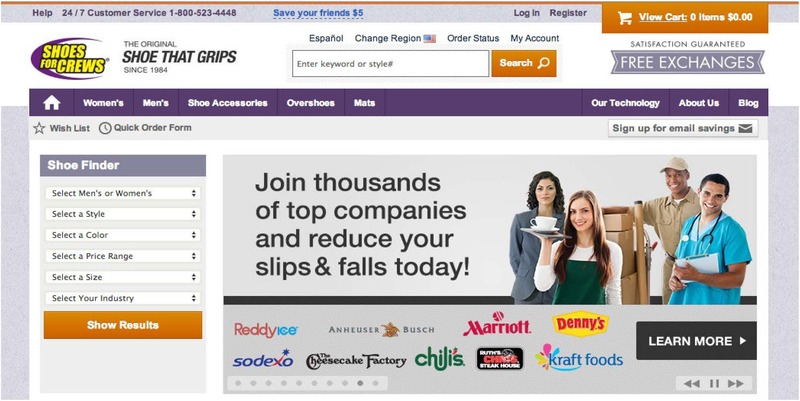 The company had found success acquiring new customers by educating employers about the dangers and financial implications of workplace slip-and-fall accidents, then demonstrating its shoes’ superior ability to keep employees on their feet. As big-name competitors began encroaching on their market, this strategy began bearing less fruit and the company needed to try another approach. Shoes for Crews began targeting employees, the end users of its products, more directly. 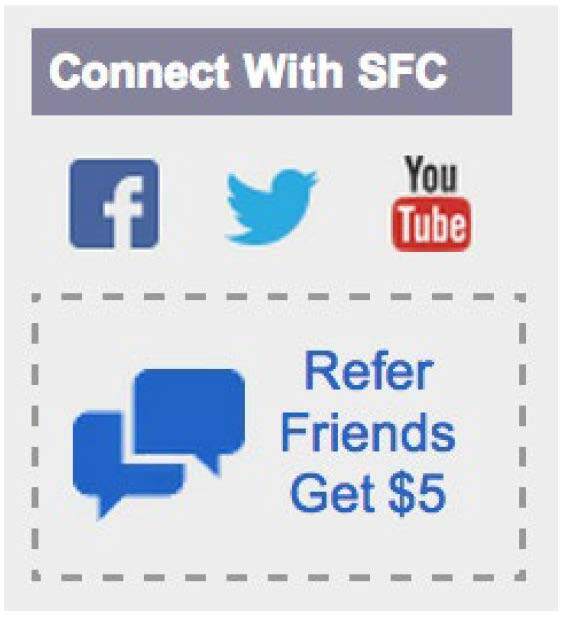 Referral marketing was the logical way to reach and engage them in an authentic and non-obtrusive manner. “A friend recommendation goes so much farther than any message we can put out there,” said Jesse Price, Shoes for Crews Director of eCommerce Marketing. When a worker finds a trusted way to avoid getting hurt on the job, it makes sense that they would share that information with friends and colleagues, putting the brand in front of new customers who otherwise may not search for it. Referrals could pay other dividends, too: “Through customer referrals, we also see an opportunity to break into new occupational segments and really gain some traction.” No pun intended, of course. 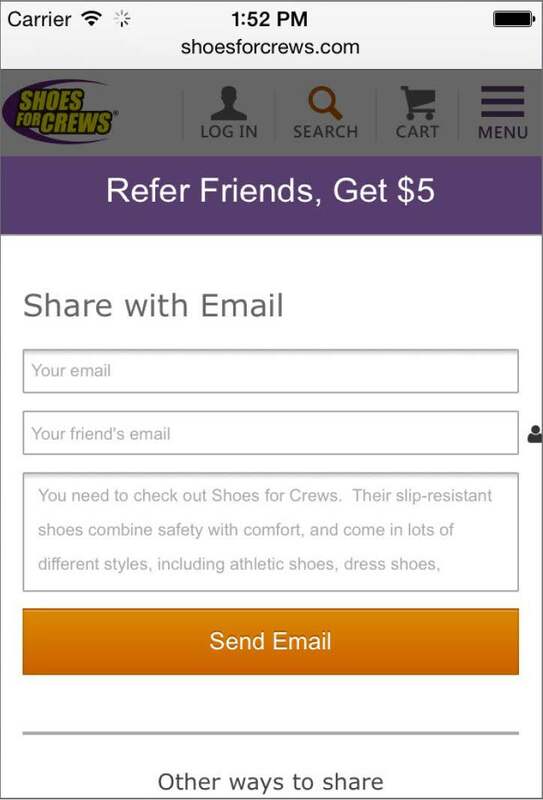 Shoes for Crews embeds its referral program in bothits mobile and web user experiences to give itself the broadest exposure — to date over 9,000 advocates have shared referrals as a result. The company promotes the program with calls to action (CTAs) throughout its sites, including in the homepage header, on individual product pages, and on the purchase confirmation page. 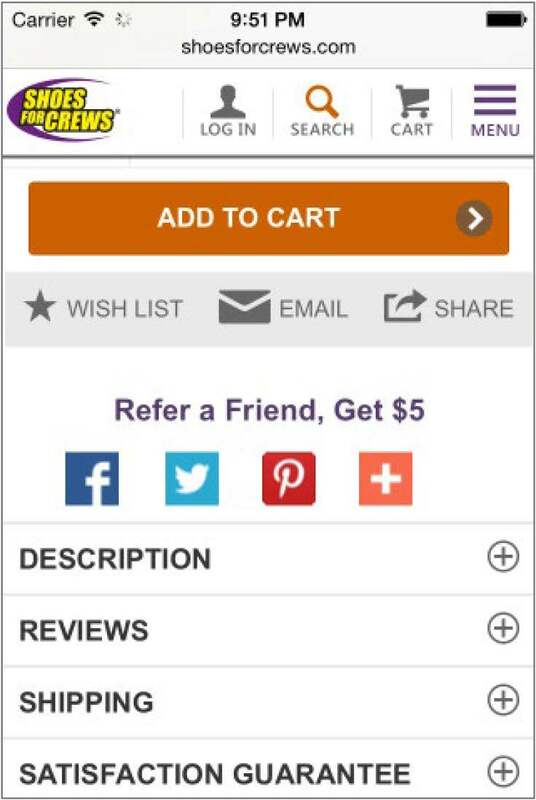 This last placement drives great results, with nearly half (47.8%) of user clicks on the CTA leading to shares. The site header also does well for Shoes for Crews — it’s responsible for producing almost 50% of the brand’s referral conversions. Adding a CTA to the My Account section of the site is a winner, too: an average of more than one friend clicks on each referral shared from that location. Shoes for Crews knows that brands can never get complacent lest competitors get a foothold in their market niche. To stay on its feet and moving forward, this brand acquires new customers using the most valuable asset it can: trusted referrals from the people who already know and use its products.